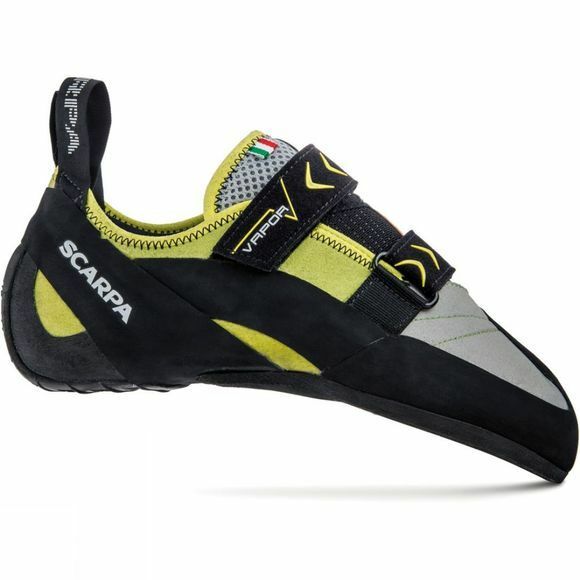 The asymmetric, moderately down-turned shape of the Scarpa Men's Vapour V offers great instant comfort. The Bi-Tension system connects the critical area under the toes directly with the heel area keeping the original shape and actively pulling power from the toes, rather than cramming your toes painfully forward, giving immediate performance with less tension, making your shoes lighter, more sensitive and more reactive. The heel fit is excellent and allows efficient and precise heel hooking while the dual power strap closure combined with a comfortable mesh tongue provide incredible fit and ventilation. Maximum edging support is provided by the Vibram XS Edge sole compound. It combines excellent pure grip with firmness for the most challenging edging moves. It maintains consistent feel across a range of temperatures and its resistance to distortion means it keeps its shape even after hours of use.